Happy Monday, friends! Here’s another look from New England… it was much chillier up there than in North Carolina, and layers felt really nice (especially in the evenings when it got down to the 30s and 40s!). 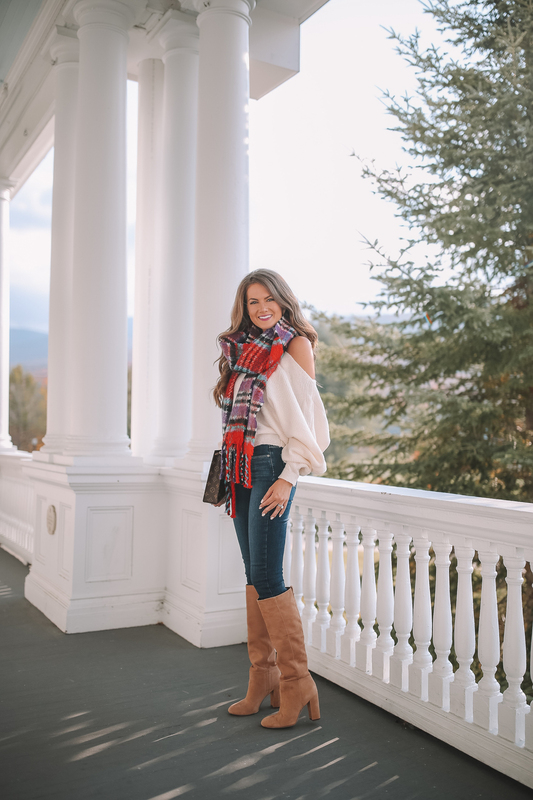 This plaid scarf is really warm and cozy… and at only $40, it won’t break the bank, either. I also love my white sweater, it’s such a great basic piece to have in your closet! You can pair it with ANY jacket, scarf, pair of pants or a skirt and it looks great. I have been wanting to go up to Mount Washington this fall! Is this the Inn? The backdrop looks gorgeous! Can not WAIT for your book recommendations list! Can’t wait to hear about this book! Also, loving the look Cait! These photos are beautiful! The colors are amazing! Yay, can’t wait to read your recommendations for new Fall books! I’m in need of some good fall books to cozy up to and read. Also LOVE the scarf! Love the photos! My husband and I are heading up to New Hampshire in two weeks for a weekend getaway…any plans to post a travel guide with restaurants or things you did!? And can’t wait for the book list! 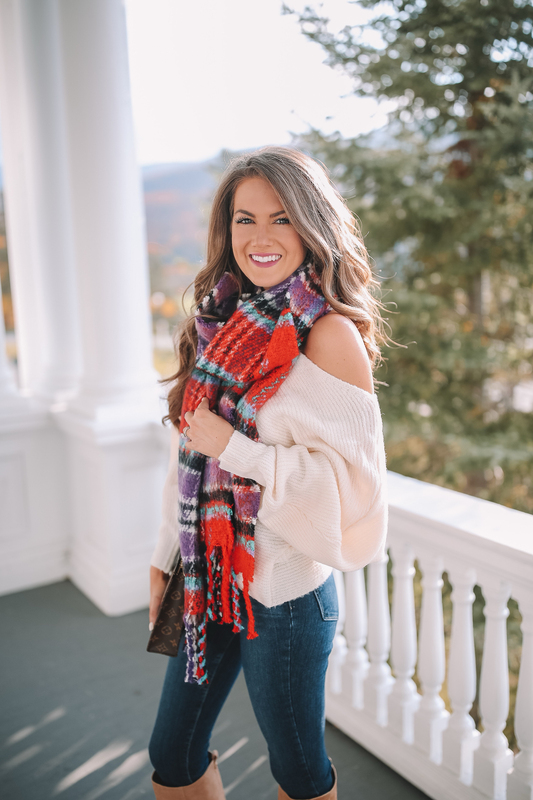 Such a beautiful scarf and look, Caitlin! Love the vibrant colors. The Omni is so lovely this time of year! Jealous! How beautiful! ! Jeans and boots! Love your blogs and visit to NH. I love the cabin from your IG post. What was the name of the cabin? Love the outfit! In Seattle it’s difficult to go anywhere without a jacket so, I appreciate you mentioning that any one will look good with the sweater! Your scarf makes this outfit!!! I always love your outfit..The boots will keep me warm in this cold weather.. I absolutely love your red scarf!! Perfect piece for the holidays!! !